Steph West’s delicately soulful performances are informed by her love of dancing rhythms, vivid chords and a free-flowing melody. 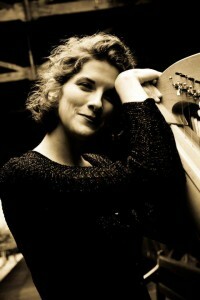 She has used her grounding in the traditional musics of Britain and Ireland to pioneer new repertoire for lever harp, building a fresh soundscape through new techniques. Steph will also include some tunes from her English harp project, introducing a wealth of styles to this versatile instrument. Whilst performing solo today, you can often catch Steph playing for the “Queen of Flutes” Jacquelyn Hynes, as well as the ground-breaking British Paraorchestra. Previously, Steph has worked with the Irish theatre company Fifth Province, and with English early music specialists Blast from the Past. As a teacher, Steph taught harp for many years for the London Irish Music School, as well as working for EFDSS, Comhaltas, the Clarsach Society and the Edinburgh International Harp Festival. Steph also helped run youth folk arts project Shooting Roots for many years, providing a fantastic space for young people to find their voice through the folk arts.